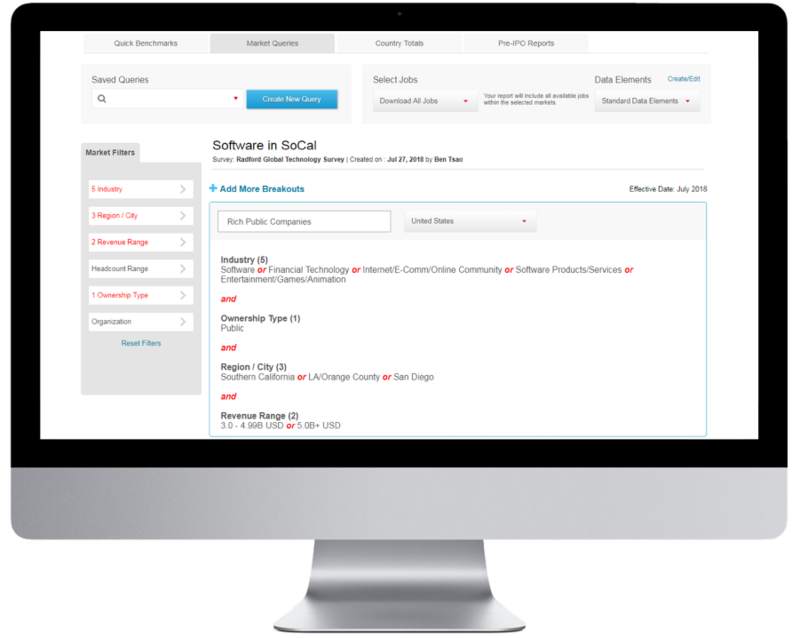 With Quick Benchmarks, you can instantly analyze pay for one, or a handful, of job families in any market on-the-fly. Your results immediately pop-up on screen, where you can then use market filters to dig deeper and eventually download results to Excel. Getting started is easy. Simply select a survey, then a country and then a job family. Next, hit show results. From there, refine your analysis with industry, regional and demographic filters to instantly see increasingly targeted data. The Market Queries tool is the powerhouse of the Radford Network. 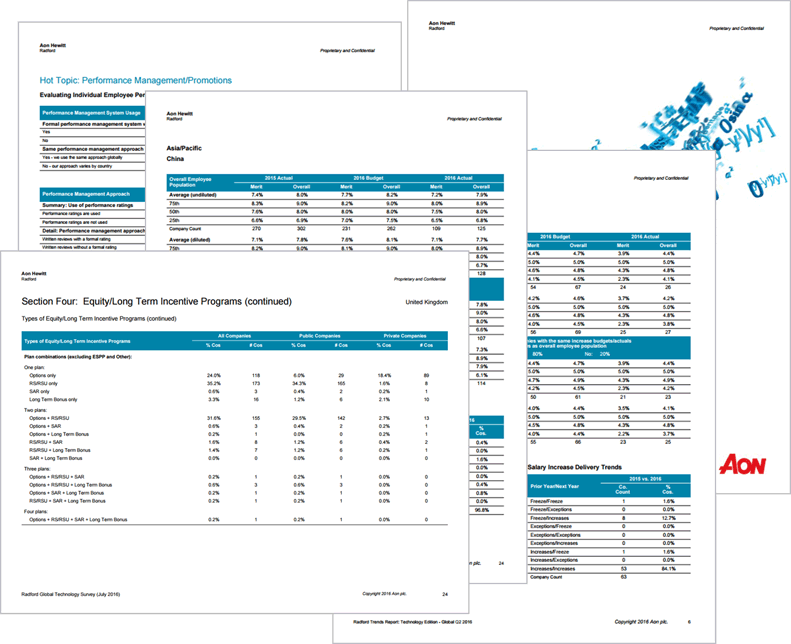 You can create, save and reuse complex queries covering multiple talent markets and hundreds of job families in one report. 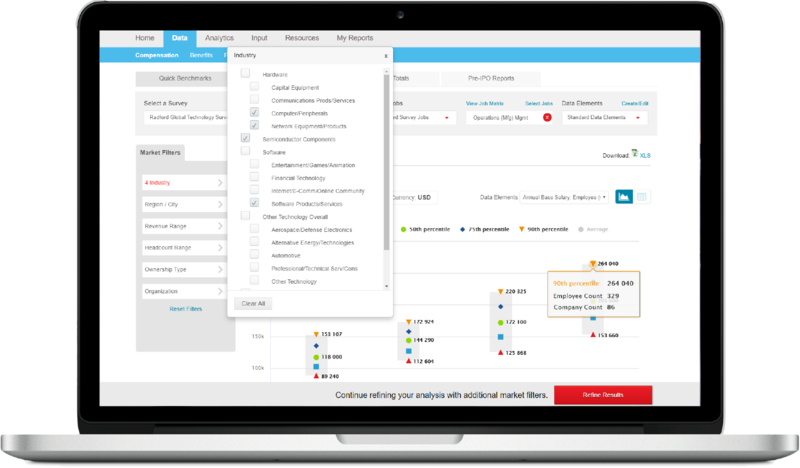 What's more, Market Queries offers you all of the customization found in Quick Benchmarks. You can create and save custom data element settings and use market filters to refine your analysis across industry, regional and demographic attributes. Once you've built the perfect query, you can then download your results directly to Excel in minutes. Want All the Data, Fast? Sometimes, highly-targeted queries don't produce the results you're looking for, especially in smaller countries. For times like these, the Country Totals tool is the perfect answer. 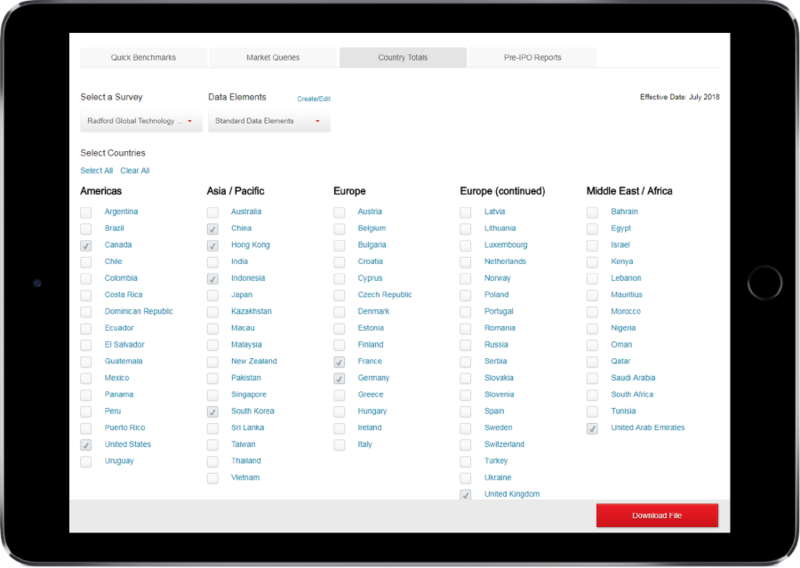 It allows you to instantly download overall survey results for one or more countries. Think of this as your shortcut reporting resource when you want overall survey results for all available job families in a country without any segmentation across industry, regional or demographic filters. However, you can always use your custom data element settings to zero-in on the data points that matter most to you. Building your rewards program shouldn't be an act of faith. If you're someone who likes to know the lay of the land before taking action, it's time to leverage our industry-leading practices and trends data. With our practices data, you'll learn how your closest peers manage their salary structures, design their short-term and long-term cash incentives, and deliver equity compensation. With our trends data, you'll understand where merit and overall salary increase budgets are headed, plus see inights on turnover and hiring sentiment. Access to practices and trends data is complimentary when you participate in one or more rewards surveys and complete required supplemental survey submissions. Explore the Radford Surveys below. All of our surveys deliver rewards insights for your entire organization. From executives to developers to scientists to sales professionals, we have you covered. See for yourself why 3,000 technology and life sciences companies rely on Radford. Learn how you and your HR team can benchmark rewards, assess plan design practices and monitor workforce trends at thousands of technology and life sciences companies around the world.